For 6 years now, 5 Texas heartthrob outlaws have waged war on Austin's steamy live music scene. Short, catchy songs are packed with fierce rhythm and quick bursts of fury. Most don't top 2 minutes. Shows range from legendary to piss poor, but something always ends up happening worth remembering, the engine always firing on all cylinders. 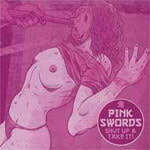 After releasing One Night High to critical raves on Mortville Records in 2003, Pink Swords have followed it up with their Gearhead Debut, Shut Up & Take It. They disbanded in the summer of 2006.